These are very busy times for Beverly Eckert’s sister, Karen Eckert. She continues to lobby US officials and members of Congress to strengthen airline safety. But last night she took the time to give me a quick heads up. She called to say that National Public Radio’s, “Morning Edition” news program would be running a recording made by Beverly about the death of her husband, Sean Rooney. I just listened to it on my local NPR affiliate, WAMU FM, and though I’ve heard Beverly’s recording several times, it once again brought tears to my eyes. It is a short segment of a long recording in which Beverly described her life with Sean, the horror of those final moments when they spoke on the telephone, and her life as a 9/11 activist afterward. An edited version of the complete recording can be found on the StoryCorps web site. I will be releasing excerpts from the longer transcript. Smoke and fumes were choking Sean as he said his last words to Beverly. “I love you, I love you, I love you,” he whispered. Beverly said she wanted to crawl through the phone and be there with him as he slipped from life. But then she heard the sound of the building collapsing. And it was over. With the killing of Osama bin Laden this week, 9/11 is once again in the news. 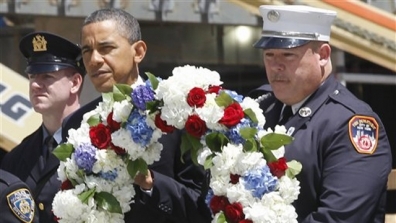 And today President Obama is visiting Ground Zero for the first time. He will meet with family members of those who lost a loved one, and spend some quiet moments remembering the thousands who perished in that spot and elsewhere. He will also lay a wreath at a memorial that Beverly and other family members fought hard to build. Karen lost Beverly in the crash of Continental Flight 3407 outside Buffalo on February 12, 2009. Pilot error was deemed a principal cause of that accident, in which 50 people lost their lives. So, just as Beverly became an advocate for families who lost a loved one on 9/11, Karen and other families of Flight 3407 have been pushing to make our skies safer. They thought they were close to new rules that would improve such things as pilot training, but with a Republican majority in the House of Representatives, the regional airline industry has found willing supporters in their effort to sacrifice safety for profits. That’s why Karen and the other family members are so busy. There are still battles to be fought.